I have to admit I find today’s topic a little daunting. Not because it’s difficult to think of a knitting hero – on the contrary, I have so many! – but because I am wary of frightening talented knitters with my fangirl enthusiasm. You know, I don’t want to be one of those people, and encourage the objects of my admiration to look into hiring personal security. There are many knitters I admire. I love the designs and photographic wizardry of Brooklyn Tweed; I am an avid reader of the Yarn Harlot‘s wit and wisdom and I find myself knitting almost every pattern by Veera Valimaki. But today, I have decided to champion some homegrown talent; British knitter Kate Davies. (Hopefully I can manage this without embarrassing either of us or causing her to take out a restraining order). 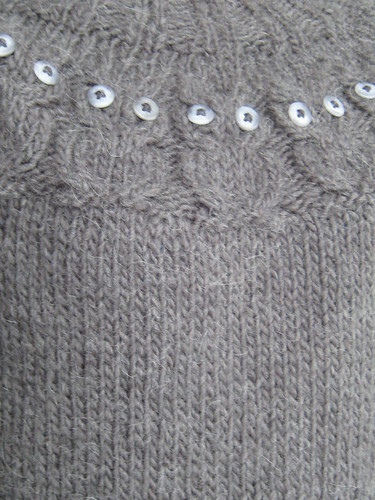 Ravelry has over 5,000 O w l s jumpers listed in its project pages. An impressive total, and richly deserved for such a brilliant pattern. It was the first jumper I made for myself in the round (now my favourite construction technique). One of the most satisfying knits I have made, it’s fast, seamless, a great fit and, in case you didn’t notice, it’s covered in fricking OWLS! If there is anything more you are looking for in a jumper then there is clearly something wrong with you. Animals are a recurring theme, and you can also enjoy Tortoises and Hares and Rams and Yowes. Knit yourself your own menagerie. The other Kate Davies pattern I cherish is Neep Heid. This hat is the first proper bit of fair isle I have ever managed, and was officially the most fun I have ever had knitting. Ever. I would knit a round or two and watch the turnips growing up the brim and giggle to myself. Like a lunatic. Because I was knitting with two colours at the same time, and they were making turnips appear before my very eyes, and this was, without question, magic. Forget Harry Potter, knitting needles beat a wand hands down. The most fun you can have knitting. The majority of Kate Davies’s patterns feature fair isle, and if you have always been slightly intimidated by this, or thought it too difficult, I urge you to try one of her patterns. As well as being fun, creative, beautiful designs, they are very well written and easy to follow. But if you’d rather stick with something in a single colour, there are the very popular Manu and Deco cardigans in classic styles you can imagine wearing for years. Alongside the designs, Kate Davies shares an impressive amount of knowledge about the history of knitting and textiles on her blog, and her new magazine Textisles. It’s refreshing to see these subjects taken seriously and passionately, when activities that have traditionally been ascribed to women are often undervalued. For anyone who thinks knitting started with Sarah Jessica Parker, or that patterns and handknitted items should be paid in peanuts, her articles and blog posts are well worth a read. She is also a champion of British wool, supporting our yarn industries, and calling for an improvement in the labelling of wool content in mass-produced garments. And I love the way her patterns often reflect the Scottish landscape or highlight the beauty of local wool. And finally, she gives a very honest insight into the challenges of living with a brain injury, following her stroke two years ago. I feel she has really helped me to challenge myself with my knitting as well as providing a good deal of woolly inspiration on several fronts, and for that the Sheep salutes her. Check out 3KCBWDAY3 for other knitting heroes. 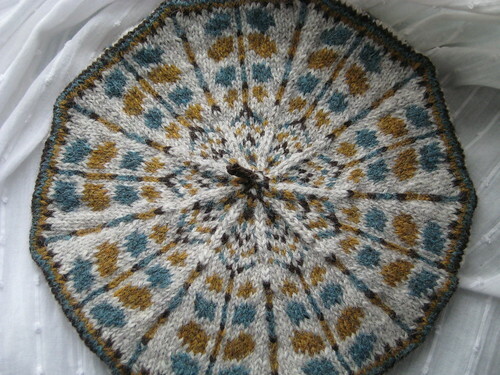 This entry was posted in Knitting and tagged 3KCBWDAY3, KCBW2012. Bookmark the permalink. A brilliant choice. I have never knitted anything by Kate Davies but have lots in my queue and I really enjoy reading her blog – always beautiful photos. Ha! I’m sure I’ve sent a couple of designers scurrying off for restraining orders! I love Kate Davies too – I haven’t actually made any of her patterns yet – but that is more a lack of time than desire. Her fair isle is just stunning isn’t it?! It is, lovely to see so many colour combinations and patterns within the designs. Very sensible. I’ve already packed mine away in the loft but could do with it in this rain! I totally agree with you, I find Kate to be extremely inspiring. You’ve just pushed me to reconsider my queue in her favour! I have been lusting after an Owls sweater for a long time — maybe it’s time I give in! So glad you chose Kate Davies – your blog and hers are the ones I look at most often. I’ve had Owls in my queue for ages and just need to pluck up the courage to take on the seamlessness! The seamlessness is great and really very easy once you get going. I find dealing with a 3-D shape that looks like a jumper much easier than lots of little flat pieces that need to be seamed. Excellent choice. 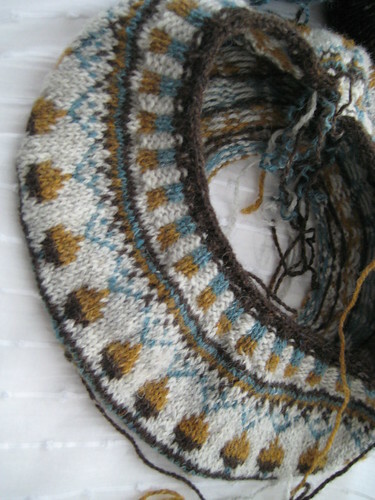 I’m halfway through a Deco sweater and working up to one of her fair isle patterns ( never done it before). I find her blog very inspiring and am cheering her new designing career on. Academia can be so draining and while I wouldn’t wish what she’s gone through on anyone, I love that the one good thing that came out of her stroke is her switch to a creative career that she clearly loves and is so talented at. Yep, I love Kate too, for all the reasons you mention – excellent choice.